We were drifting home from our holiday up by Hadrian's Wall (having stayed at the Grindon Cartshed), when we saw a sign for the Lakeland Bird of Prey Centre, and decided to follow the signs.. As it turned out, we followed the Sat Nav instead of the signs and that took us by the scenic route (but it was very scenic!). Still, we got there in the end, and found the car park full (that was a good sign). We squeezed the car into something that was nearly a parking space, and scrabbled together the cash to pay for entry (they don't take plastic money!). 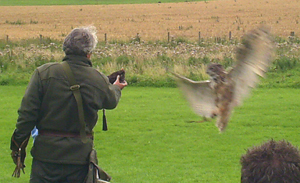 As it turned out we got there close to the beginning of the falconer's afternoon display session. So we got to see some of the birds in action - an eagle owl, a peregrine and a gerfalcon. Some of the visitors were introduced to the birds, as the falconer had a spare glove handy, and their faces of enchanted bemusement were a picture to behold. We saw the birds fly from perch to the hand - and having a peregrine falcon swoop past at ankle level is the sort of experience one doesn't forget! - and we saw them fly at a lure to demonstrate some of their hunting behaviours. 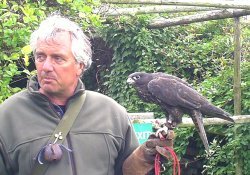 Paul Bevan clearly knows his birds, and he knows about falconry, about the history and current practice and about the conservation element of his work as well. Importantly, unlike other displays I've seen which have been rather full of numbers and statistics, he has a fund of anecdotes about the birds - which thus become personalities in their own right - and about falconry in general. He uses the stories to highlight the facts, making them entertaining as well as memorable. Nor does he subscribe to the lunacy of shielding the public from the facts in case they are scared or put off. Birds of Prey are, above all, predators, and it ill becomes a predator like a human to be shy of the fact. It does the birds no favours either. Evolutionary development has engineered the birds superbly for the challenges they face, and that is one of the most intriguing things about them. Paul is down to earth and factual, but he doesn't sensationalise the hunt, and he's not attracted to gore. It is simply that birds have to hunt for food whereas we go to the shops!